Metal City is an extra racecourse in Sonic Free Riders and also serves as the course that the game's tutorial takes place in. 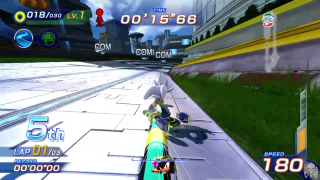 The Easy version of the course is a recreation of Metal City, the first track from the original Sonic Riders, music and all, in Free Riders' improved graphical style. The futuristic automobiles and trucks return as obstacles, while holographic billboards still advertise the EX World Grand Prix. This page was last edited on 5 May 2018, at 14:21.